We just celebrated my son's 8th birthday. He didn't want a cake this year...he wanted peanut butter rice krispie treats! I was glad to have that request! Quick and easy and very tasty! Heat corn syrup and sugar almost to a boil. Then add the peanut butter. Mix. Add the rice krispie cereal. Spray a 9 x 13 inch pan and add mixture. Put in a microwave safe container. Microwave in 30 second intervals, stirring between each interval until melted. Then spread over the rice krispies in the pan. Let the chocolate harder and then enjoy! Sometimes I put the pan in the freezer for a little bit to help the chocolate harder quicker, but don't forget about it! This recipe does sound quick and easy. I'm a peanut butter lover and I love rice krispy treats, so I'd love to try this with peanut butter. Thanks for sharing this sweet treat. So family sends Happy Birthday wishes to your son! Yumm! Pinned this just now! Hope it brings some traffic your way! Also following your blog now! I love yall's sister picture. I am one of four sisters too! Peanut Butter and Chocolate...MY WEAKNESS! Thanks for linking this to Totally Tutorial Tuesdays. Be sure to check back Friday to see if you've been featured. Ok, YUM! Thanks for sharing! I shared on Facebook, too! What a great idea! These look so tasty! I have a sister blog too! 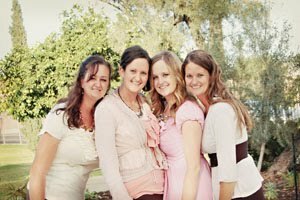 4 LDS sisters. OOOH YUM! I think I have a problem when it comes to rice krispies--I CAN'T stop eating them! Oh my. These look like they would be dangerous in my house. For me of course. I'd probably finish them off by myself! Sounds and looks delicious. and its gluten free!! (ill have to check on the butterscotch chips but I believe they are Gluten free) my daughter is allergic. Hope to see you at DIY Home Sweet Home. I'm also your newest follower. Cute blog. Those look amazing. I've never seen a recipe that includes rice krispies, chocolate and PB. Yum! Thanks for linking to my party. Please come back and visit! How yummy with that topping! Makes them extra gooey and delicious! What a fun and easy recipe! Thanks for sharing! Those look so good. Following from midweek fiesta. Yummy!! Thanks for linking to Things I've Done Thursday! & hope to see you in next week too..
You seriously have the coolest posts! I'd love to have you link up to my party at http://scrapbookingez.blogspot.com/2011/11/anything-goes-linky-party_17.html. Thank YOU! I am going to have to try this recipe. I have tried to make rice krispie treats and they never turn out right! I love peanut butter with just about anything. this recipes sounds so good and easy. that's my kind of style. Wishing you a Happy thanksgiving. Thanks so much for sharing at Sunday's Best! These look and sound delicious. I'm definitely making these soon!! Mmmm, my SIL makes these. I think the key to making them is almost bringing it to a boil (I usually go too far and it boils) so it is nice and chewy. Thanks for sharing this delicious recipe on Monday madness.